« I’ve caught the stamping scrap page bug! It was an unseasonably wet and cold day yesterday in Tenterfield and I’ve been wanting to scrap this photo for some time, but didn’t quite have the correct inspiration. That could be due to the fact I’ve not had heaps of experience with sepia photographs. 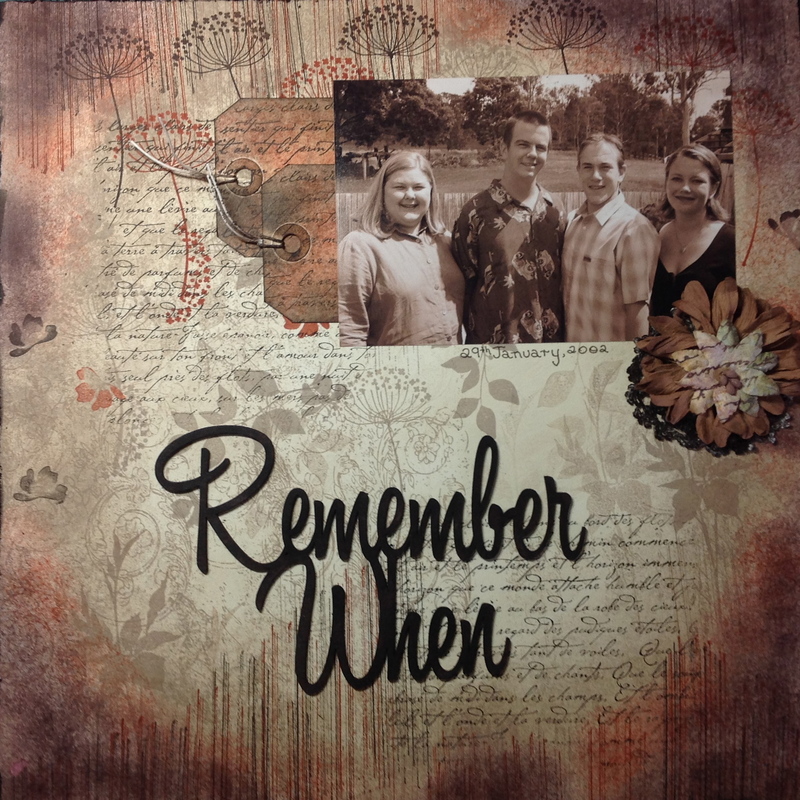 So wanting to continue with the stamped background trend and wanting to show all my stamping friends how economical it is to scrapbook. You don’t necessarily need to have heaps of embellishments etc. when you have INK!!!! GLORIOUS INK! So this LO has lots of INK. Sponged, stamped, rolled, distressed. I even took the pad directly to the edges and ran the stamp pad up and down and all around the edges. I had such fun, I cannot wait to try another. The LO itself was inspired by one I spotted in a Scrap magazine lately. I hope you like the LO as much as I loved doing it. I must also add that this technique was demonstrated by a very talented N.Z. girl (Liz Hicks) at a Stampin’ Up! convention some years back. I’ve attempted to replicate Liz’s style previously but ended up in a mess and put it in the ‘too hard’ basket. This time perseverance paid off. Thanks Liz! Making my LO look sensational are my four sensational looking children. L to R. Sharon, Joe, Tony and Aedita. This photo was taken the morning after Tony’s 18th birthday party. So if they look ever so slightly hungover, then you are correct. I’d love to hear your comments on this one as it’s the first of this style that I’ve attempted. There’s lots of product used here. INKS – Crumb Cake, Early Espresso and Cajun Craze.